The Judge's Lodging01544 260650work Historic HouseWander through the stunningly restored judge's apartments, study the books, sit in the judge's chair, even pump water in the kitchen, for this is an historic house with a difference - you can touch! Below stairs there is the full range of servants rooms to explore, with kitchens, sleeping quarters and workrooms; a whole gaslit world to discover. Damp cells remind you of the building's true purpose, along with the vast courtroom where your imagination is captured by the echoing trial of William Morgan, local duck thief. Find out about the rural Radnorshire Constabulary, the tragic tale of Mary Morgan, reputedly the last woman to be hanged in Wales, the terrible state of and great escapes from Presteigne gaol, contrasting with the luxurious lives of the judges - what better place to discover for yourselves the true theatre of the law. New local history galleries with changing exhibitions - see website for full details of what's on. 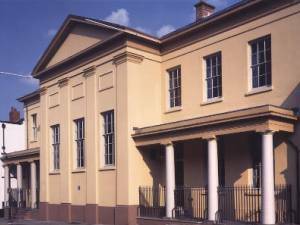 Wander through the stunningly restored judge's apartments, study the books, sit in the judge's chair, even pump water in the kitchen, for this is an historic house with a difference - you can touch! Open by prior arrangement for groups at any time, including evenings. Note - you should leave at least one and a half hours for your visit. Presteigne town centre. Half way down Broad Street, from High Street end. Large yellow building on right. Has TIC signage outside as well as official Judge's Lodging plaque fixed on wall.